Do you have problems with your moving and unstable sofa? Do you wish to stop the recurring scratches and noise on your home floors caused by a moving furniture? If your answers to these questions means a \'Yes\' then you need a very simple solution known as the Non slip furniture pad. 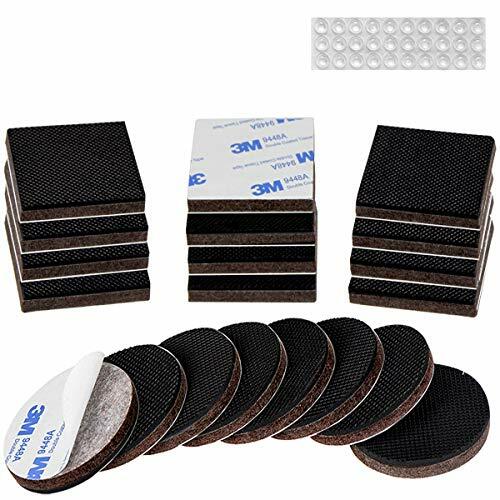 With this small but highly effective and efficient anti slip furniture pad, you need not worry about destroying your home floors and aching sounds of a moving sofa or other furniture when you sit or lay on them. The furniture pad is easy to use and can fit into the legs of any furniture either small or big. This furniture pad is of good quality and it will easily solve the challenges of any moving furniture by preventing with from moving and destroying your home floor designs. You cannot prevent this even with time and money at your disposal but a furniture pad is all you need. Many furniture pads are sold elsewhere but our furniture pads stand tall among other furniture pads with exceptional features and functions. Our furniture pads have up to 0.3 inches of double padded rubber and felt which ranks as the best material for absolute quality couple with strong eco-friendly adhesive that holds it with the furniture to prevent pulling off. 1. Make sure the furniture leg surface where the furniture pads will be is clean, dry and smooth. 2. Cut the furniture pads to size if needed, remove the paper and press in place for 10 seconds. 3. After pressing the furniture pads in place let it stand for the next 24 hours without moving.